The color red can add drama to any space and can warm up a room that would otherwise be a little tired. 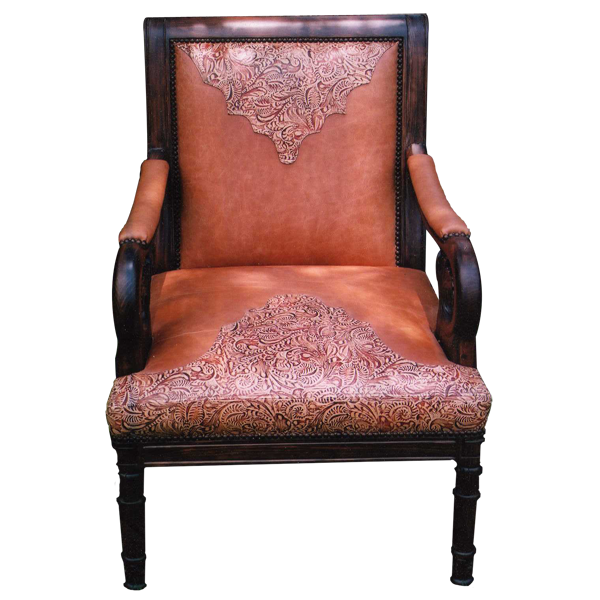 If you want to liven up your home décor, consider this magnificent, Western style handcrafted chair. The lower seat and upper seat back are upholstered with red, intricate, embossed full grain leather in a Western cut design. The armrest, upper seat and lower seat back are upholstered with brilliant, red stained full grain leather. The armrest are beautifully curved and are decorated with a hand carved scroll design. The upholstery is carefully hand tacked to the entire wood frame by our skilled craftsmen. The slightly slanted front legs are beautifully hand turned and the back legs are straight and tapered. Both beautiful and durable, the chair is made with the best wood available. It is 100% customizable.